I decided to take some cut offs, from the project I can’t show you until next week, and rather than throwing them away I decided to piece them together. 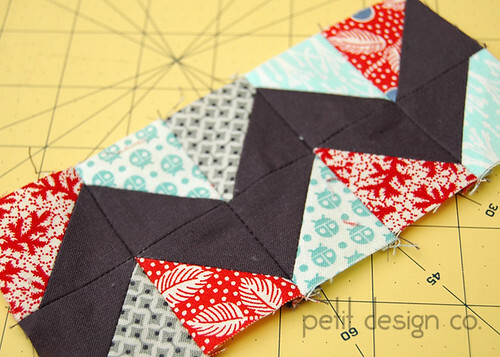 By “cut offs” I mean those little triangle pieces or “ears” you get when you are piecing larger blocks and the instructions tell you to use a square, mark on the diagonal, and then trim after stitching. Yeah, those little triangles. It seemed like a good idea at the time but I was ready to chuck the whole thing as seams started getting thick. The trick, I found, is to use steam or in my case a spray bottle to really get those thick seams to lay flat while pressing. Good thing I only had 10 of those units to work with because there is no way I would have tackled a project with more units than that. I do like the cuteness factor of the scale though. Each HST unit measures 1” finished. This larger zig zag unit will make it’s way onto the back of the project. What do you do with your “cut offs?” Do you save them for a “someday” project, chuck ‘em in the trash without looking back, save them for scraps, or… ? Love your craziness! I try to save my little bits, but never seem to go back and use them! Maybe I should start! I keep them, sew them together, and then shake my head at the fussiness of it. but it makes for fun design elements. I have been saving them, but like Lesley, I'm really not sure what for. I haven't really made much with them yet. I'm a saver too but have only glanced in the direction of my cut offs stash and sighed. I'm just not sure what to use them for....hmmm might make for an interesting challenge?! Sew.a small pillowcase, and put it in a small waste basket, lie you would a garbage bag. Throw in you scraps. When its half full, sew the little pillowcase closed. 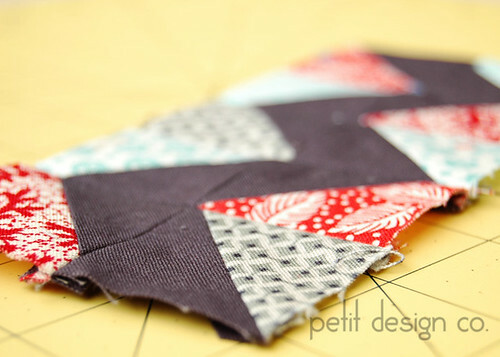 A quick easy project that uses up those scraps. Ah, you're just like me. I never through away anything at all. Right now I'm participating in Bee in my Bonnet row along, and there are so many corners to cut away. I sew them together after each row, and I soon have a littele cute dollquilt. Happy weekend! What you are calling cutoffs...I call leftovers... Like after a meal. One year Iwas making a lot of purple quilts and had lots of these purple "leftovers" Made a lovley purple crib quilt.